Combination of traditional Rock Ola good looks with Touchscreen technology! The Bubbler Series IV Music Center is an exciting addition to the Rock-Ola family of finely crafted classic jukeboxes featuring cutting-edge digital music technology! 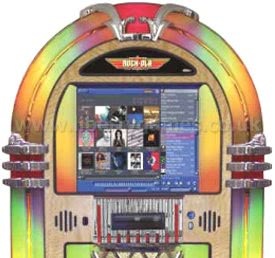 The Rock-Ola Bubbler Series IV Music Center jukebox is based on the classic nostalgic CD model - itself designed to evoke the classic Rock-Ola experience of the 1950s. Bubbles of air perk merrily to the top of the 8 bubble tubes and a kaleidoscope of colours flow through 4 colour translucent plastic cylinders. All the trims are genuine die cast metal that has been triple plated with copper, nickel and polished chrome and the handcrafted quality of the cabinet is evident in the finest hardwoods that adorn this stunning jukebox. The Bubbler Nostalgic Music Center was the first of its kind to feature total touchscreen control of loading, organising, and playing your CD music selection. The Series IV model has a 19" touchscreen with SATA technology and exclusive Qsonix "Drag & Drop" system. New front lighting highlights the exquisite cabinet design and enhances the user screen and there is an incredible 1TB of storage - meaning you can hold up to 13,000 albums on one Jukebox! A CD is loaded into the system's DVD drive. A broadband Internet connection immediately locates and downloads all CD information - including the cover art, free! The CD is automatically loaded to the music system hard drive. Home-made compilations and self-recorded music may also be loaded - the touchscreen allows manual input of information not otherwise available. 1TB of Storage can accommodate up to 13000 CDs. This stored CD information becomes an on-screen catalogue, allowing the music lover to browse a collection by Artist, Album, Genre, and more! Create and store multiple play lists with a theme - play a whole album or just a tune. Imagine all your favourite albums available for play at a finger touch! Imagine Thousands of your Favourite Albums at a Finger Touch! And You're the DJ!